The decline of reported honeybee colonies has been widely publicized for several years, leading to many organizations and individuals to contribute in some way to the fight to bring those numbers back up. Some people simply plant bee-friendly flowers and cut down on pesticides, some companies hold fundraisers for research, and some very dedicated individuals even try to take up beekeeping themselves. However, while the heart of that latter group may be in the right place, one beekeeping organization out of Pennsylvania is saying novice beekeepers may just be the greatest threat to honeybees yet. Michael Scott, who helped create the group known as Indiana PA Honey Bee this past year, has gone on to say the notion of honeybees declining at accelerated rates is highly exaggerated. According to Scott, the national studies behind all the headlines focus on the number of the bees that die every year, but not their net population, thereby leading to very inaccurate counts. Since the 40s, after the federal government ended beekeeping subsidies, many people no longer register their hives if their state doesn’t require it, causing researchers to conclude that significant numbers have perished. However, because surveys are only sent beekeepers with registered hives, this method has holes. “Everybody thinks bees are in trouble. They’re not,” Scott said. Because of the belief that honeybees are in danger, beekeeping has grown in popularity, but beginning beekeepers are unwittingly becoming an issue. For instance, many novices buy colonies from warmer climates and bring them up north to states like Pennsylvania, and those bees cannot survive the winters up there. Scott says starter packages from warmer environments have an 80 percent rate of failure, which only contributes to declining numbers. 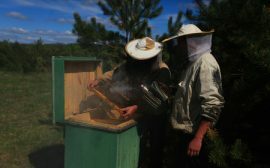 Beekeeping is a practice requiring dedication and time to be successful, but it also requires proper guidance and education, with Scott specifically saying a mentor goes a long way toward creating an adequate beekeeper. Hopefully, those who wish to “help” honeybees learn how to do it properly before they spend the average $1,200 it takes to get started.